Nininger - Swindle or Land deal gone bad? It’s like the man in too-tight pants who remarked that “these trousers remind me of the ballroom in McGregor, Iowa. There is no ballroom in McGregor, Iowa.” Well, apparently there was no “dry goods store” on first street in Nininger, Minnesota either and Donnelly found himself the only inhabitant come 1857 in a scheme his “enemies later depicted as classic swindle.” (pg 667). Wiki-Nininger seems a little kinder regarding Donnelly’s legacy and disputes some of Salinger’s assertions, mainly by listing the population of Nininger in 1858 at 1000 people rather than 1 and including no mention of a swindle. I love the fact that there is a brother-in-law of a state governor involved. Those connections of politics and speculation always seem to shout out “Ruse.” But what’s the real story? Was it a “classic swindle” or a just a land deal gone bad – a victim of the monetary crash of 1857 that throttled the country amidst plummeting land values. Sound familiar? But who’s to blame? Was it Main Street, Wall Street, or First street in “downtown” Nininger? 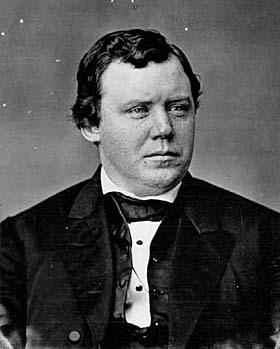 J.M Tyree writes in his article, Ignatius Donnelly, Prince of Cranks, of Donnelly being “quite possibly the greatest failure who ever lived.” Along with his troubled involvement in Nininger, Donnelly distinguished himself as a gifted orator, out-spoken politician, best-selling author, and according to Tyree, a failure in each arena. What a character. I ran across a second source of Donnelly material included in the book entitled, Idiot America: How Stupidity Became a Virtue in the Land of the Free.” I’m beginning to see a trend here, aren’t you? Apparently the “Sage of Nininger” isn’t faring too well through the lens of time. In his lifetime, he had both fans and detractors but, to his credit, he sure was entertaining. The MHS published an article in 1953 by Martin Ridge which makes the case that foibles and failures aside, Donnelly was a genuinely funny guy – not a jester – but a fellow who understood humor, and could weave a spell-bounding tale keeping his audience, including his critics, highly amused (MN History Magazine). 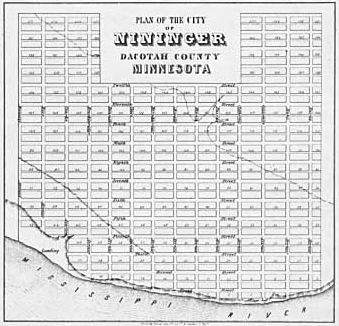 “The economy was booming in this area before the Panic of 1857 and Minnesota was platted, or laid out, for enough towns to accommodate a population fifteen times the state’s actual numbers! One territorial legislator with a sense of humor, noting the alarming number of proposed towns, offered legislation setting aside 1/3 of Minnesota for agriculture. Nininger City, near present day Hastings, was typical of the real-estate speculator’s dreams to capitalize on the territorial boom, except that it was Ignatius Donnelly who promoted this particular town as the “Chicago of the North.” Donnelly partnered in this venture with John Nininger, brother-in-law of Alexander Ramsey. Nininger’s wife noted that “two heads were better than one even if one – even if one should be a ‘Sour Kraut’ and the other a ‘Paddy.’” Donnelly promoted the town as far away as Scotland through speeches, a newspaper, and an Emigrant Aid Association. By the summer of 1857 the “city” reached the point of having nearly one hundred houses, a school, an Atheneum, and a modest cultural life, but water was still being brought up from the river by oxen. The fate of Nininger City was hurt when Hastings won the designation of county seat, but its fate was sealed in August of ‘57 when credit tightened [is this starting to sound familiar?] and banks called in their western paper. Speculative ventures like these “paper towns” were hardest hit. The depression also dried up the land grant program for railroads and the proposed Nininger, St. Peter, and Western Railroad, a necessary component to the town’s success, was a casualty. Donnelly’s nearly realized dream of becoming a millionaire vanished. This entry was posted in Mississippi River and tagged Donnelly, fraud, Mississippi, Nininger, speculation. Bookmark the permalink.